Fast Search for eBay speeds up your eBay searches when using Chrome | ComTek Computer Services Inc. When eBay started, I used the site a lot to buy and sell items of interest. 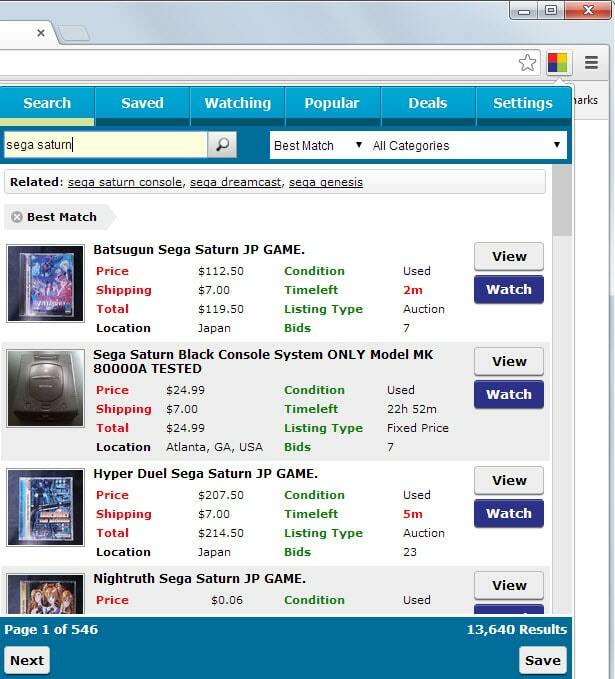 While that included mostly video games and systems such as the Sega Genesis, Saturn or Dreamcast, I used the site to buy other items of interest and to just browse various categories in search for the next bargain. This time has come to an end mostly, and I'm not sure it is because I stopped buying all these products or because eBay changed fundamentally over the years. Whenever I visit eBay nowadays, I find the site difficult to navigate and use. The Chrome extension Fast Search on eBay improves the search functionality a lot. It adds an icon to Chrome's address bar that you can click on to display its interface. To search, you simply type a search term and hit enter. Before you do, it is possible to select a specific category you want to restrict your search to change the sorting order from best match to others supported by eBay. Searches can be saved so that they can be opened at any time from the saved tab. The settings provide you with many different options. You can switch to another eBay store, the default is US, change the number of results per page from 25, or set min and max prices for items. Other than that, you can filter by conditions, only display listings that offer free shipping, or display only sold or no longer available items in searches. Here you can also select to display results in a tab instead of the overlay window that they are displayed in by default. The extension has a couple of issues such as display issues when you search on another store and find words with Umlauts (äöü) listed in the results as they are not displayed properly by it. So who is this for? The extension improves search on eBay and if you are a regular on the site buying and selling items, then you may appreciate that fact. It can also be useful if you happen to use eBay once in a while and like to start searches without opening a new tab and loading the main eBay site. The ability to save searches and watch auctions independently may appeal to some users as well, especially since it is not linked to any eBay account.